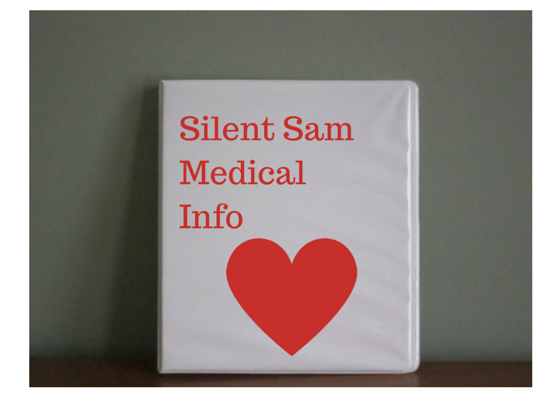 Last week I talked about having a medical information binder. It can not only save you time but it could also be a lifesaver. This week, let's look at your medications. Should you keep your medications in the bathroom? This is something that we all do that we shouldn't. Your bathroom has temperature and humidity changes that are not the best for your medications. It is far better to keep them stored out of the sunlight and where the temperature is relatively constant. And if you are like me, somewhere that you will remember to take them! One of the ideas that I like is to keep your medicines all together in a plastic bin. There are all sizes and price points available these days. 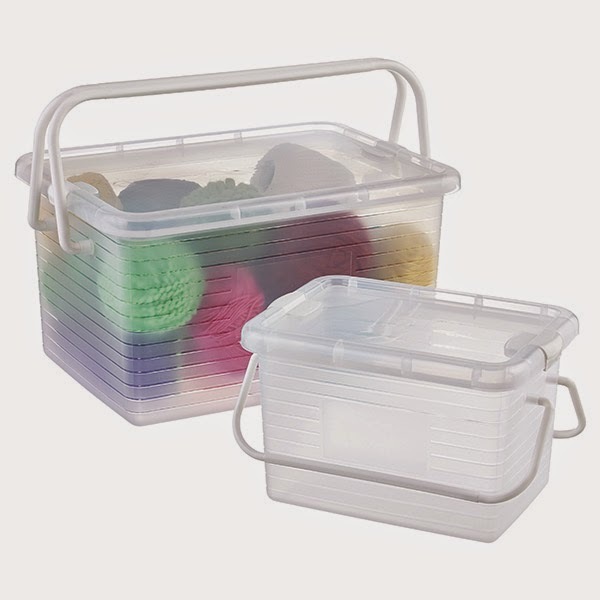 I was looking at the web site for the Container Store and saw some that might do the trick. They even have a handle so that you can just pick up and go when you are traveling. Also with the lid on the box, it is easier to keep it away from your pets. The sides are translucent but the top is clear so you can easily look in it. Somehow every time I go to clean out my medicine cabinet, I find unused prescription medicine. Now you know that these days you are not supposed to throw those medicines in the waste basket. But do you know what to do with them? I found a web site that will direct you to the closest pharmacy that will take back the drugs for proper disposal. You can go to Dispose My Meds and click in the upper right hand corner on the word "locator" and then fill in your zip code. It will then show you where you can go in your area. Also, check with your town. Where I live, we can take old prescription medicines and sharps to town hall for disposal. 3. Put this mixture into a disposable container with a lid, such as an empty margarine tub, or into a seal-able bag. 4. Remove any personal information, including Rx number, on the empty containers. You can cover the label with black permanent marker or duct tape, or scratch it off . 5. Place the sealed container with the mixture, and the empty drug containers, in the trash. We sometimes forget to take medicine. It is not out of the ordinary for me to put reminders in strategic places. Just a little reminder hidden away! Of course the other thing you can do is use the alarm function on your cell phone. That is an easy way to remind yourself. I hope you have a great weekend! Take care! We all know that eating in a healthy way and exercising are an important part of diabetes care. But are there other things that can impact our care? Of course our mental state and thoughts about the disease made a difference. It is felt that one of the things that can help is to have our physical space set up so that we can easily find supplies and remember to use them. This month in Diabetes Forecast, the magazine of the American Diabetes Association, there is an article on de-cluttering and organizing to make your home a bit more diabetes friendly. It just so happened that I have been thinking about cleaning out and de-cluttering my work space. I am beginning to think that perhaps some of my occasional dread and unproductiveness could be due to the amount of stuff I seem to have collected on my work desk. It all starts innocently enough. I have several piles around the desk. One pile is bills that need to be paid, one pile is either correspondence that I have not responded to yet or articles that I want to read. There is yet another pile that is special offers that have come in the mail. (Hate to miss those specials, right?) Along with the other things that can just accumulate on my desk, it means that I end up working in a smaller and smaller area. 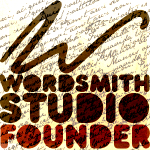 This does affect my attitude toward my work. The more that accumulates, the less I want to work and the quicker I am distracted from my work. So, I will have to take time to clean off my desk. And let me add the word “AGAIN”. I seem to be able to conquer the clutter beast only to be faced with it again in a few months. While it is disheartening, it just seems to be the way it goes. But is there a way to de-clutter or organize to make dealing with diabetes easier? Yes, it seem that there are things that you can do to help yourself. One of the first things that the author talks about is having a binder where you keep all your medical/emergency information. I think that having such a binder is a great idea. First of all when you are going to the doctor, you can just grab the binder and take it with you so that you have all the information on hand to give the doctor. Also, if you have to go to the hospital, you have all the current information right at hand. One section of the binder can be a contact list all your doctors, pharmacy, and any other members of your diabetes team. You will want the name, specialty, and phone number included. You might even include a copy of your insurance card. There could also be a section that has a list of all your current medications. Depending upon the type of organizer you are, you might want to keep the receipt from the pharmacy that gives the name of the medication, the prescriber, and the date you had it filled in the binder. If you don’t want to have the receipts there, you could just have a list but you will need to update the list each time you refill or get new medications. (This is a moment where I would suggest to you to use the KISS* method. Make it as easy as possible to keep up as possible. If you are thinking of keeping a list, do a bit of soul searching as to whether or not you will really keep the list up.) With the pharmacy that we use, you can go on line and print out a list of your prescription records. You can just print and insert into the binder whenever you get a new or refill prescription. I would also keep a general calendar of when you have doctor’s appointments. By this I mean a page that has all 12 months on it and you note what months you are due to see part of your diabetes team. You could then put actual appointments in the correct month. When you go to the doctor and are asked when you are due to see another one of the team, you can look in your binder and it will be all mapped out. Also, one look at the first of the month and you can tell if you need to make an appointment to see one of your doctors. 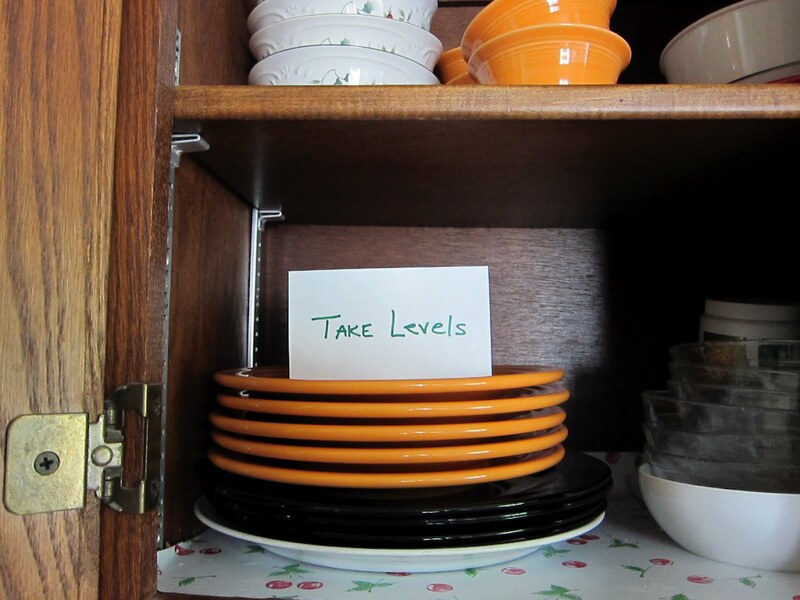 You might want to have a section that indicates where to find your medications in the house. Also, a section with some general information about how to recognize and treat diabetes related problems like hypoglycemia. The most important thing is to keep up the information. Part of being able to keep the information current is to have it in a convenient place. You need to think about where to keep the binder. The location would depend upon how you do things in your house. I know that when we pick up a prescription, it ends up on the dining room table and then the medicine is removed from the bag and put in the bathroom or on the dining room table (so we will remember to take the medicine). For us, getting the receipt in the binder would be best if it was in the dining room but we don’t really have a place to put it there. So the next best place is in the kitchen. It could go by the cookbooks. As long as where you keep it makes keeping it up to date as easy as possible for you. Next week some other organizational ideas! *KISS method – Keep It Simple Stupid an acronym used by the U. S. Navy. Labels: Medical Information Binder, organization, Organizing to help your diabetes. Here it is roaring up on us – Valentine’s Day. That day of hearts and love and PRESSURE. I sometimes wonder if there are more people who love Valentine’s Day or if there are more that dread it. I also wonder if a greater share of men dislike the day. Silent Sam and I do not celebrate events in a big way. We usually get cards (one funny and one serious) and then sometimes a gift and sometimes not. This is a year that we are not exchanging gifts for Valentine’s Day. But I was wondering about gifts that would not be the usual flowers or candy. So, if you are looking for some ideas, I have a couple for you. 1. I received the following gift a few weeks ago and I thought it was really cool. It is a jar with 31 little envelopes. Each envelope has an inspirational card in it. The gift is available from 1-800 Flowers. Here is a link to it. 2. My next idea actually goes back to my high school days. One year I gave the love of my life a keychain engraved with our initials. His on one side and mine on the other. My girlfriend thought is was a great idea and she did it too. Her gift was infinitely more humorous since her initials were “VD” and his were “BS”. Still it was a nice gift. You can check your local jewelry store or here. You are right, I just love telling that story. 3. The American Diabetes Association has many items available that not only can help you but you are also donating via your purchase. Their shop is located here. 4. I have talked about medic alert bracelets before. It is nice that you can find cool ones to wear. If you need one or want to look at an interesting selections you might want to check out Lauren’s Hope Medical I D jewelry. 5. Another type of gift is to make a donation to an organization that helps people with diabetes. I have just heard about an organization that looks like it deserves your attention. It is called Spare a Rose Save a Child. Those are just a few ideas for you to use to celebrate Valentine’s Day without flowers or chocolate. Have a lovely Valentine’s Day!